This article was originally published on Ron Miksha’s blog. Sir Edward’s family could have given him a wide range of advantages, but they did their best to wreck the young man instead. He overcame the burden of privilege, but it took an unusual and sympathetic teacher to help him realize he wasn’t stupid. Bullard’s great-grandfather Richard owned The Goat, a once-popular Norwich pub, and started a brewery, making the family wealthy. Bullard’s grandfather Harry was thrice elected mayor, knighted by Queen Victoria, and was Member of Parliament for Norwich – until he was expelled for bribery. On the other side of the family, Bullard’s maternal grandfather, Sir Frank Crisp, was a lawyer whose client list included the Japanese Imperial Navy. Crisp also inked the contract for cutting the largest diamond ever found, the 3,100-carat Star of Africa. Frank Crisp was an amateur scientist, an officer in the Royal Microscopist Society, an enthusiastic gardener, and was rumoured to be insane. He owned an estate where he erected a replica of the Matterhorn featuring a cave populated with garden gnomes. At the gate to Friar Park where he lived, the retired solicitor erected a statue of a monk holding a frying pan punctured by a pair of holes. He called the statue “The Two Holy Friars.” Young Teddy Bullard, the future geophysicist, enjoyed spending a month each year at his eccentric Grandfather Crisp’s 120-room house near Henley, until Sir Crisp died bankrupt in 1919, when Bullard was twelve. Years later, ex-Beatle George Harrison bought the holy friar estate and turned it into a comfortable home for his final years. Bullard’s father was dyslexic and performed miserably at school. Edward Bullard himself was similarly afflicted, claiming his inability to spell was hereditary. For his education, Sir Edward Bullard was first placed in a girls’ school, a place dunces in those days were sometimes sent. At age 9, his parents transferred him to a stodgy grammar school which made him so miserable he considered suicide. Anxious because of his grandfather’s mental state, the family alerted a psychiatrist who recommended that the child, by then 11, be sent away to a boarding school. Teddy refused, but his parents sent him anyway. There, at age 12, he was tested and placed next to last in a classroom of eight-year-olds. He survived the experience and was rewarded with promotion to a strict secondary school with equally privileged classmates where he once again felt miserable and performed poorly. But a physics teacher with a doctorate arrived and took a serious interest in young Bullard’s future. He set the young man loose in the library with problems to solve and lectured him privately two or three times a week. It worked. The physics teacher changed young Bullard’s life. Edward Bullard applied to Cambridge and became a theoretical physicist. Against such disadvantages of upper-class birth, Edward Bullard became one of his generation’s most brilliant and hard-working geophysicists. 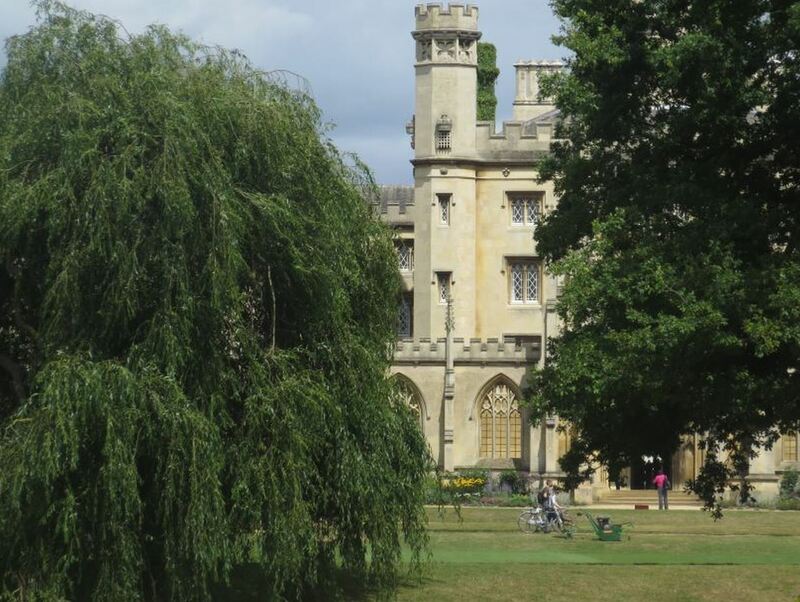 St John’s College, Cambridge – Bullard’s campus in the 60s. At Cambridge, Bullard studied physics under Lord Patrick Blackett, his doctoral adviser for a quantum mechanics thesis, and a scientist later awarded a Nobel Prize. Then Bullard worked with Nobel laureate physicist Ernest Rutherford, also at Cambridge. But by 1931, the Great Depression dried up funding for pure research – advancing the science of quantum physics was not deemed essential while millions of unemployed roamed England’s streets. Bullard’s boss, Rutherford, reluctantly sent Bullard away to teach applied geodesy – glorified surveying techniques that might help farmers and navigators. Through geodesy, Bullard became a gravity expert. He understood the physics behind surveys and maps and he determined the Earth’s gravity distortions and nuances of our planet’s non-spherical shape. Geodesists calculate innumerable perturbations, all of which affect the orbits of satellites, the flight paths of missiles, and the drafting of maps. Before the Second World War, Edward Bullard also researched Earth magnetism and crustal heat transfer. During the war, he found ways to use geophysics in Britain’s fight to survive. He devised a method to demagnetize British ships so they could avoid German detection and he used magnetic disturbances to locate enemy mines. After the war, Bullard headed the University of Toronto physics department, then went to La Jolla, California, to work for Scripps Institution of Oceanography. At Scripps, Bullard designed a tool to measure heat as it flowed from the ocean’s floor. But eventually Bullard returned to England to unravel the mystery of the source of the Earth’s magnetic field. He did the math and physics that showed how motion deep inside our planet generated magnetism. “There is always a strong inclination for a body of professionals to oppose an unorthodox view. Such a group has a considerable investment in orthodoxy: they have learned to interpret a large body of data in terms of the old view, and they have prepared lectures and perhaps written books with the old background. To think the whole subject through again when one is no longer young is not easy and involves admitting a partially misspent youth. Further, if one endeavours to change one’s views in midcareer, one may be wrong and be shown to have adopted a specious novelty and tried to overthrow a well-founded view that one has oneself helped to build up. Clearly it is more prudent to keep quiet, to be a moderate defender of orthodoxy, or to maintain that all is doubtful, sit on the fence, and wait in statesmanlike ambiguity for more data (my own line till 1959).” – Bullard, Edward (1975). “The Emergence of Plate Tectonics: A Personal View,” Annal Review of Earth and Planetary Science. 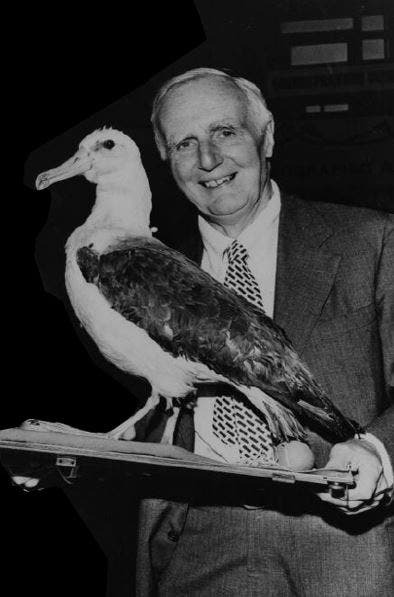 Bullard, receiving The Albatross Award, an ignoble geophysical prize. Edward Bullard’s conversion to plate tectonics in 1959 made him an early adopter of the theory. 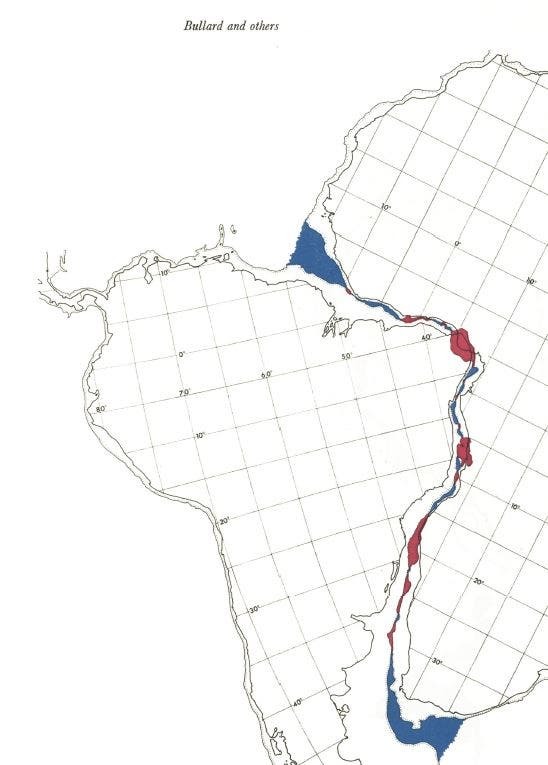 Although Wegener and others had made their continental drift proposals early in the 20th century, the bulk of the geoscience community didn’t switch until around 1967. For seven or eight years, Bullard was one of a handful of prescient scientists who saw the crust as a dynamic feature. But his conversion was only cautiously expressed. Although his work in theoretical geophysics, heat flow from the crust, and magnetic field generation were his greatest triumphs, Bullard’s signature contribution to plate tectonics was a map of the continents that cleared up one of the uncomfortable issues that made some geologists balk at the notion that continents once fit snuggly together in Pangaea. In 1965, Bullard constructed a map that fit the continents together without the huge gaps and overlaps that had plagued earlier researchers when they drew maps of Pangaea. It was a simple remedy. 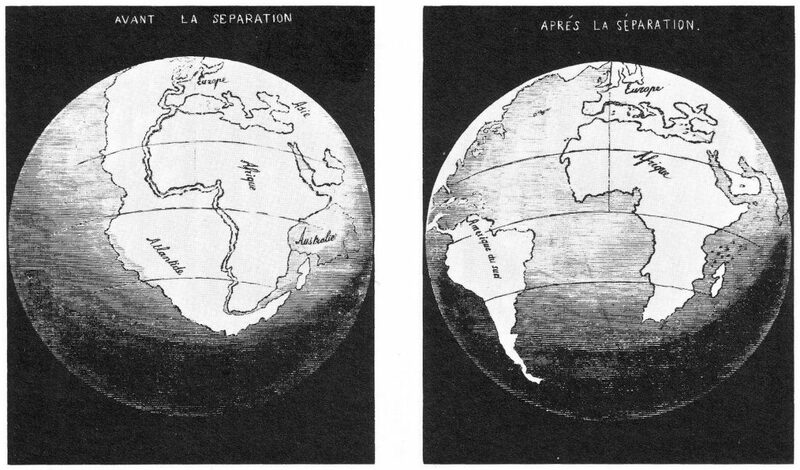 Rather than using today’s coastlines as the outlines of continents, Bullard mentally drained the oceans, exposing the continental shelves, then he graphically connected the enlarged continents into Earth’s earlier supercontinent. The fit went from a sloppy cartoon to an almost perfect reconstruction. “Only two explanations have been proposed for the approximate fit of the continental blocks; either the fit is due to chance similarities, and is on a par with the similarity of the coast of Italy to a boot, or the continents were once united and have separated with the formation of the Atlantic Ocean. Other explanations are hard to find, they would involve similar processes carving similar shapes on the two sides of the ocean. 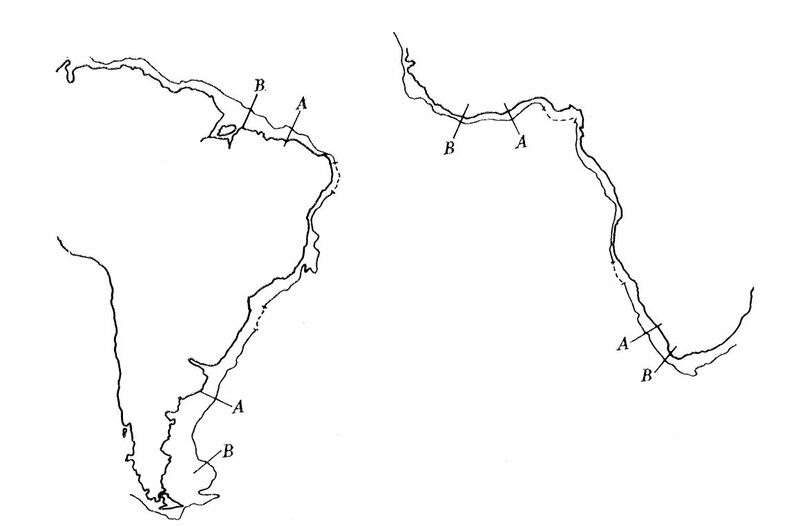 It is difficult to decide by statistical theory alone whether two continental edges fit more closely than would be expected by chance.” – Bullard, Everett, and Smith (1965), “The Fit of the Continents around the Atlantic”, Philosophical Transactions of the Royal Society of London A.
Bullard and his colleagues conclude the paper by indicating that the evidence sides with continental fragmentation as the creator of the Atlantic. But even late in 1965, it was a tough sell so they nuanced their result. Bullard wrote that verification of the fit as part of a previous supercontinent would come with a comparison of stratigraphy, structure, mineral age dating, and remnant rock magnetism. He was right. Bullard, et al., the mathematical fit of South America and Africa, 1965.